Subscribe for every vinyl release on Specialist Subject in 2018! The subscription's back for another year! Fourth time we've done this now and it's gone pretty well so nothing to fear. Expect at least 10 releases (mostly LPs / 12"s, maybe a couple of 7"s). The first package with the initial gifts will be posted from early-mid December, if you're in the UK and you get your order in before the 19th, it'll be with you for Christmas. Price this year will be £100 plus postage (free if collected from the shop). For UK subscribers releases will be sent as soon as they are ready throughout the year. For international orders there's now two postage options, a more expensive one if you want every release as it comes out or a cheaper option which will be split into a few deliveries throughout the year. 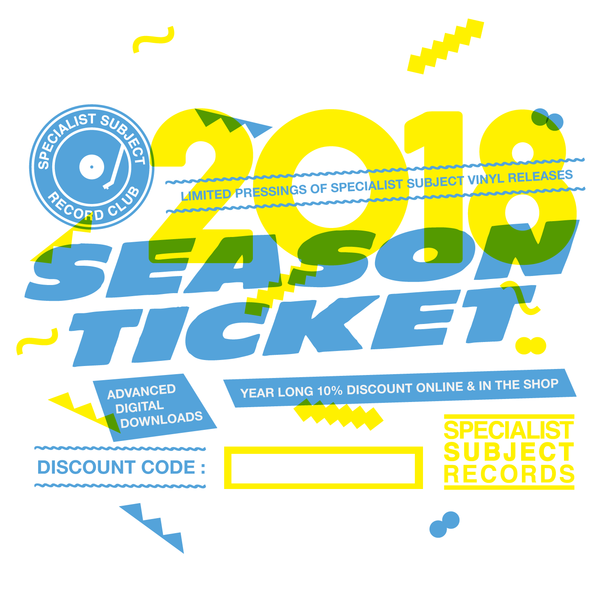 Where possible if you're ordering other records we'll ship them for free with your Season Ticket deliveries. If you're ordering for someone else, please put their name, email and full address in the notes when you order. We won't contact them until the new year.